The Phytophactor: Weed? of the week - Bald cypress in flower? Some plants are weeds, some plants are just weedy or invasive. That's the case with this week's weed, while not a weed per se its definitely weedy and invasive. 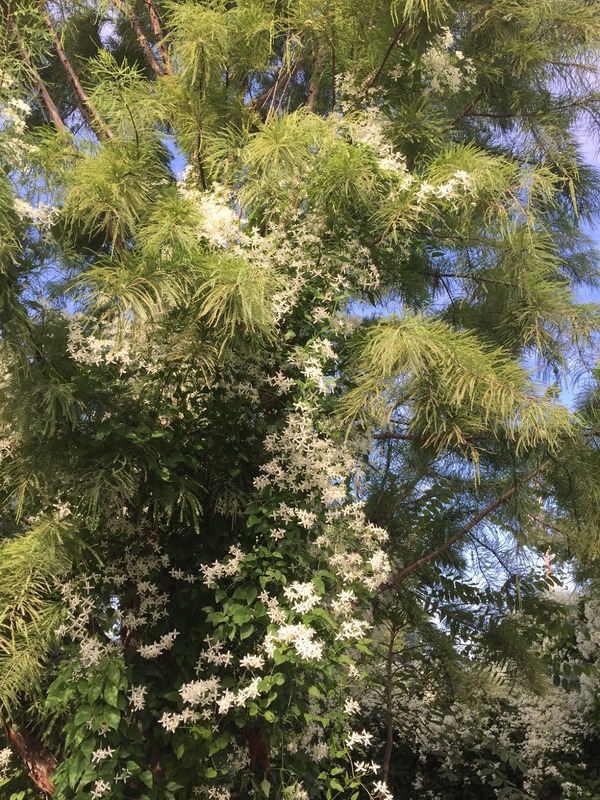 On one previous occasion TPP was called to identify a strange flowering tree, one that towered above the street with a profusion of orange flowers. It was a bald cypress that had been climbed by a trumpet creeper, Campsis radicans, a bignon vine. The combination fooled a lot of people, but bald cypress trees flower so seldom TPP wasn't fooled. Day before yesterday a similar combination was noticed on the Phactors' morning errand/coffee walk, a youngish bald cypress whose crown was nearly filled with one or more sweet fall clematis vines (Clematis terniflora). This is a perennial, most weeds are annuals. But it is quite prolific and you find the seedlings popping up every where, particularly in messy waste areas. By fall the vines will cover trellaces, fences, trees, shrubs, and anything else it can climb, up to 20-25 feet. 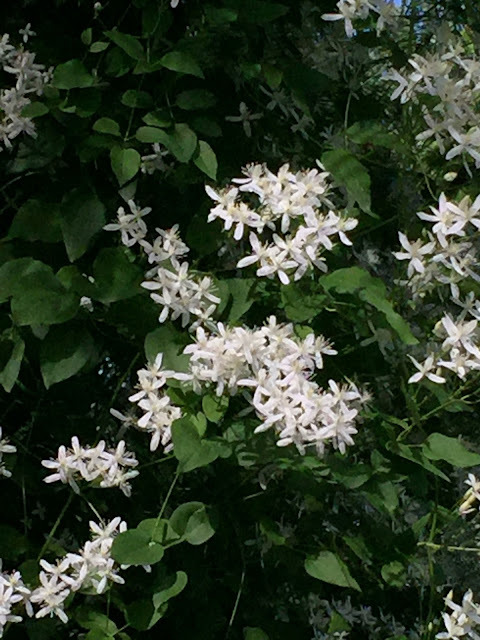 When growing on crappy old fences or crappy old shrubs, it's fine, and in flower the autumn clematis is quite a treat. Quite handsome and rather fragrant (sweet) to boot. Even in the spring the perennial base is difficult to get rid of. Digging, chopping, spraying, they all work to some degree, none are best or perfect. TPP cuts them off at ground level and treats the cut surface like a tree stump with an herbicide. If you like what the sweet fall/autumn clematis does for your garden, take a hedge pruner to the vine after flowering and before fruit/seed dispersal; this is called dead-heading. It works well for this vine. And the seedlings are fairly easy to spot and kill if they are growing where you do not want the plant (TPP's definition of a weed.) So be very careful about planting this species. You've been warned. Labels: Clematis terniflora, invasive vine, sweet autumn clematis, weed?